Originally posted on April 24, 2017. 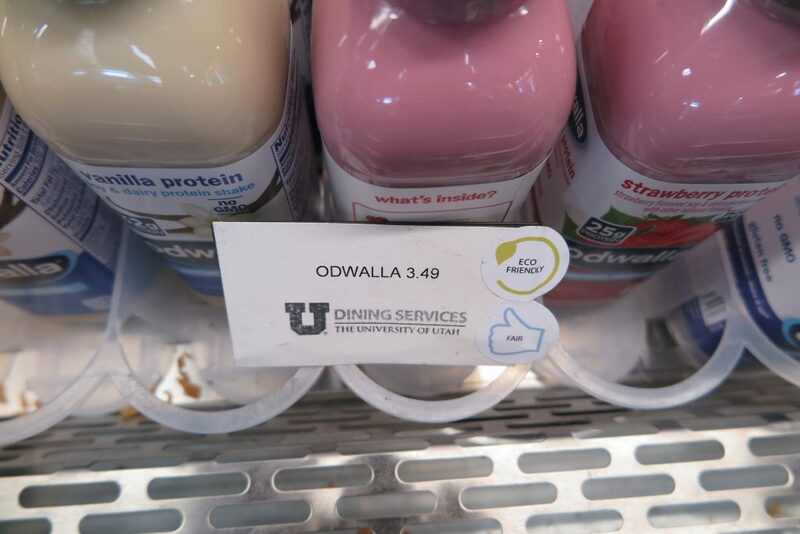 In February 2015, President David W. Pershing committed the University of Utah to the Real Food Challenge — a goal to have 20 percent of the university’s food categorized as “real” by 2020. “Real food” is a newer term used to describe food that is local/community-based, fair, ecologically sound and humane. This semester “real food” labels have arrived in some campus stores, and the local New Roots Farm, which employs refugee farmers, has begun sourcing organic produce to the Peterson Heritage Center dining hall. The new labels highlight the elements of “real food,” and are now on food items at Mom’s Café and Mom’s Pantry at the Marriott Library and the Counsel Café in the S.J. Quinney College of Law. In fall 2016, New Roots Farm provided 500-1,000 pounds of organic produce to Dining Services, according to Chris Natalie, farm incubator specialist at New Roots Farm. The farm operates under the International Rescue Committee, equipping people from refugee communities with garden beds through a community garden program and enabling them to grow food for their families. If individuals are moved into the farming program, they have the potential to make an income from farming. “I can see reaching the goal of having 20 percent real food on campus before 2020,” said Daniel Waters*, assistant to the executive head chef for University Dining Services and food sustainability coordinator. GET INVOLVED: Use the Real Food guide to put your food to the real food test. If you are interested in the progress of the Real Food Challenge on the University of Utah campus or want to get involved, email realfoodutah@gmail.com. *Editor’s Note: Since the time of publishing, Daniel Waters has moved on from the U. Follow Sustainable Utah and stay in the know about U of U sustainability!